The presentation of the role of surgery in the treatment of neurobrucellosis is the scope of this chapter. As laboratory and imaging diagnostic methods and antibacterial drug regimens continuously evolve, the same occurs to operative equipment and methods. Surgical involvement in life-threatening conditions such as brain and spinal abscess is thoroughly presented. In this chapter, special issues such as cerebrovascular involvement or intraparenchymal lesions are addressed. Intervention in structures with high morbidity like the cervical spine is exposed. 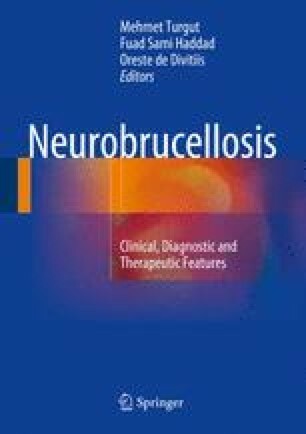 Minimal invasive techniques, stenting, grafts, and instrumentation are presented in a friendly way for anyone who is involved in the treatment of neurobrucellosis.